2b) To conduct Coaching or Admin business (schedule practices/games, send team e-mails, post a team bulletin)? 4) Not receving CRNAA and/or Coach e-mails? 5) Problems with Online Registration? 6) What is My League & Team? And where do I find my child's schedule, roster, standings, etc? 7) What about the Online Store? 8a) How does a parent send an e-mail to the entire team his/her child is on? 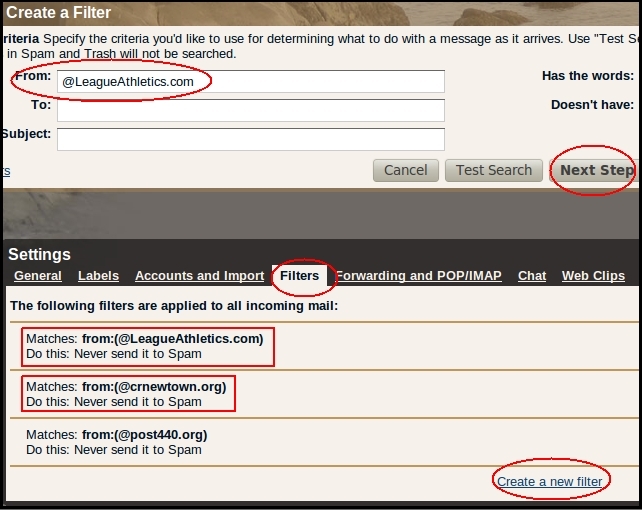 1) What is a LeagueAthletics website, and what features does it offer CRNAA? Communications - LeagueAthletics offers our Coaches and League Staff extremely robust and customizable commications options via the website, including targeted e-mail, and even text messages. You control how and where you want to be contacted, what kind of reminders you want, if any. It is imperative, however, that you enter notification@leagueathletics.com into your e-mail address book. All the the leagues communications come from this ficticious address and will end up in your junk or spam if you don't add this address. 2) How do I log in? There are two types of logins: one for families, to edit their personal contact information, pay outstanding registration costs, add a child to their family, etc. 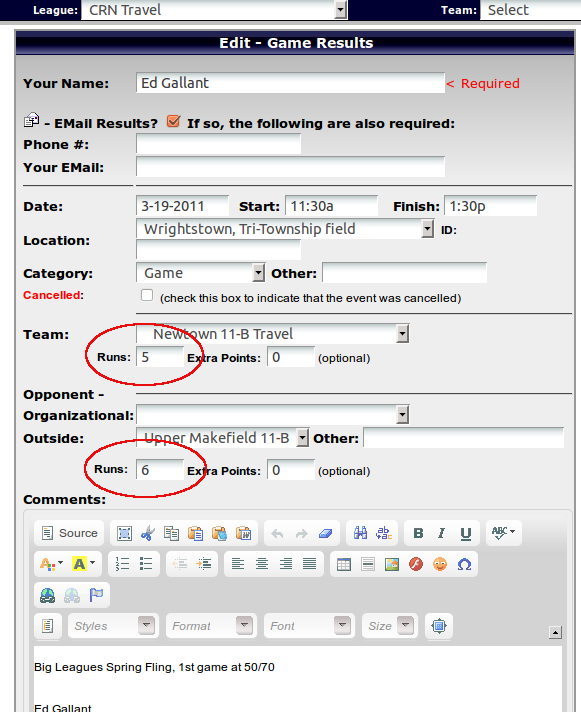 ; and one for Coaches and Admins to schedule practices, send team e-mails, post team bulletins, enter stats, etc. 2a) To edit my family data, pay outstanding registration costs, add a child, etc.? Family members can log in via the Edit My Account button in the left hand column of the screen, or via the Log In box at the top right of the screen. Either method is fine, both will bring you to the family member list, but if you use the top right Log In, you still need to click on Edit My Account in the left column, after logging in, to actually update family data. 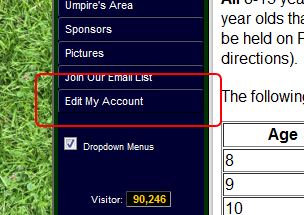 If you are a Coach or Admin, and you want to edit family info, you must log in via the first option below. If a Coach logs in via the Log In option on the top right, he/she will be in Admin mode to do coaching activities: schedule practices, send team e-mails, etc. Your login is your e-mail address and password. If you've forgotten your password, or don't remember creating one, simply enter your e-mail address, with no password. Check your e-mail. A new password will be emailed to you. Return to the website and log in with your e-mail address and the password that was mailed to you. 2b) To conduct Coaching business (schedule practices/games, send team e-mails, post a team bulletin)? To access Coaching (or Admin) features, you must log in via the top right Log In area. Note that in 2012, LeagueAthletics simplified the login process for coaches and admins, you always use your e-mail address and password now. There is no more first name last name logins with separate passwords. Once you log in successfully you'll most likely be transferred back the home page. If you return your focus to the top right of the screen, click on Administer to perform Coaching or Admin functions. You can use the drop down menu from Adminster, or simply click on the word itself to be transferred to the classic Administrative Features screen (below). See additional help topics on how to send team e-mails, post team bulletins, schedule practices, etc. 3) How do I register my child? There is no need to log in before beginning online registration. You'll be transferred the Online Registration area. There will be significant detail on dates, program eligibility, etc. At the bottom of this screen will be several panels to allow you to register your child(ren) in our in-house programs (Little League and Babe Ruth). The cost structure is generally by age. You'll be asked to log in. If you're a returning family to CRNAA, enter your e-mail and password. If you've never had a child play in CRNAA before, enter just your e-mail address and temporary password will be e-mailed to you. If you're a new family to CRNAA, you'll be presented with a form and asked to enter information about yourself, and then the child's other parent (or guardian), and then after entering both parents, you'll be asked to enter information on the child you're registering. If you're a returning family to CRNAA, you'll be brought to your list of family members. Click on the icon next to the child that you wish to register. If the icon is not clickable, that particular child is not age eligible for the program you picked (see below). At the end of registration you'll be offered the option of paying or registering another child. 3a) How do I register my child for select teams like Travel, Legion or Sr. Babe? Select teams, such as Travel, Legion and Sr. Babe do not have public registration panels. However the registration is still done online. Tryouts for these teams are announced on a page under My League & Team. After tryouts, the Coach submits the list of players chosen to the website administrator. The website administrator then e-mails the parents of the selected kids a private website link to register for that program. The registration process happens exactly like the public online registration demonstrated above, it is simply accessed through a section of the website that you cannot find without the private link being e-mailed to you. 4) Not receiving CRNAA and/or Coach e-mails? With the purchase of powerful new web-based league management software from LeagueAthletics, CRNAA is now able to send e-mail from within our website to groups ranging in size from everyone in CRNAA to very unique, narrowly defined subsets of the CRNAA family, with minimal effort. Further, CRNAA Administrators, Managers & Coaches, the Snack Shack Coordinator, etc., should never again have to collect your e-mail address from you. 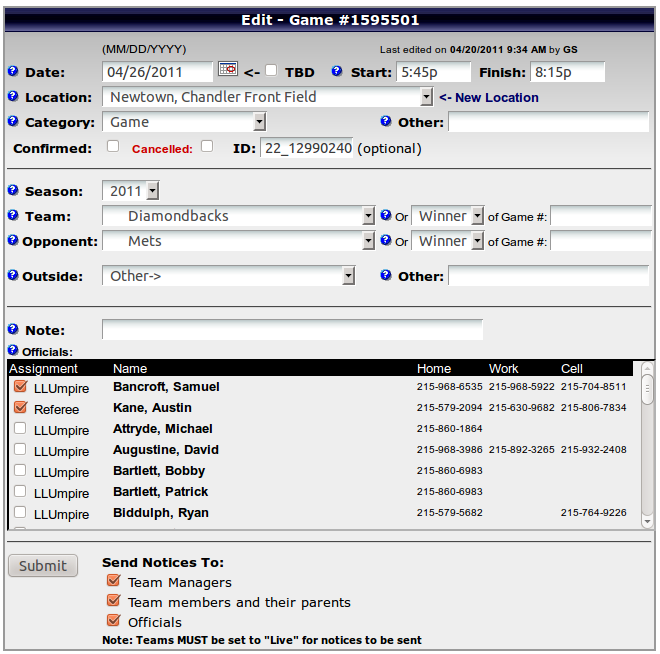 Your family's information is stored in a secure database at LeagueAthletics via the My Account feature. 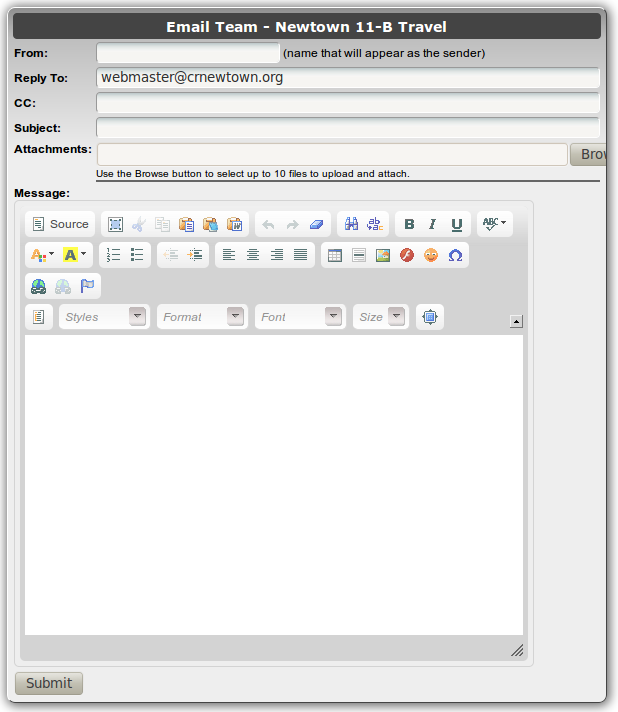 CRNAA, Managers, Coaches, the webmaster, etc., simply create e-mails from within the website that are sent out to you. The author of the e-mail does not know your e-mail address, does not know if you've provided two e-mail addresses or 100 (which you can do), and he/she does not know if you change your e-mail address in My Account mid-season or three times during the season. All he/she does is define who he/she wants an e-mail sent to: all of CRNAA, all 8 year olds, just the 2011 Orioles, etc., and it is sent out to whatever e-mail address(es) you have on file in My Account. For all of the above reasons, it is critical that your keep contact info under My Account up to date. The responsibility of making sure your personal contact information is up to date will no longer be on Coaches or League Administrators, it will rest with you. E-mail delivery issues generally fall into two categories: those who have accidently opted out of our e-mails, or those who have not properly configured their e-mail system to accept e-mails from notification@leagueathletics.com. The "opt-out" problem is easy to fix. Log in, click on every family member, and make sure no one has checked "No Email". If anyone in your family has checked this box, it can prohibit anyone in your family from receiving our e-mails. As LeagueAthletics web software manages several thousand sports leagues around the country, there are a million e-mails out there everyday from . For this reason, some e-mail programs will determine our e-mails are Spam, unless you tell your system otherwise. 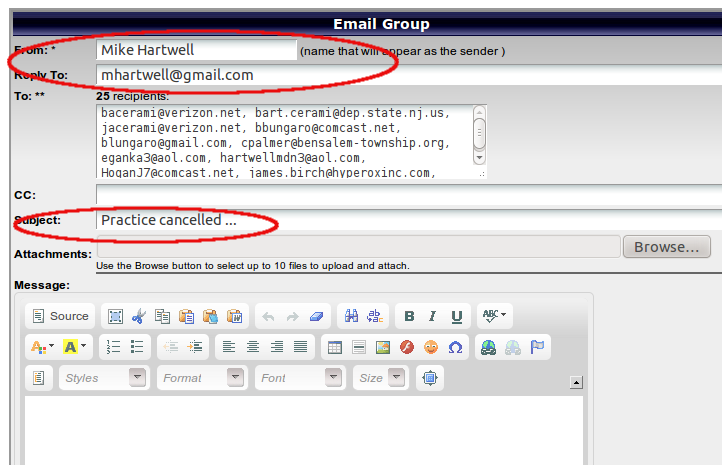 The most common way to inform Gmail, Verizon, Yahoo, Comcast, etc. that you want to receive e-mail from an e-mail address is to put the senders e-mail address in your address book. Not into your Blackberry or iPhone address book, but in your www.gmail.com, www.verizon.net, mail.yahoo.com, www.comcast.net, etc., actual address book. 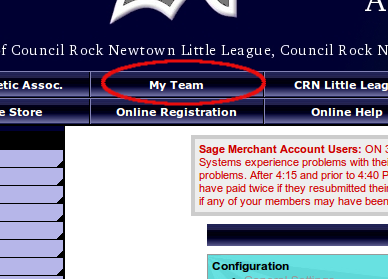 It is also worth knowing that a number of league staff now have e-mail addresses from the domain @crnewtown.org. Comcast users: Keep in mind that if you have your Spam filter on, Comcast allows Spam to be deleted without ever even making it to your Spam/Junk folder. So you may never even see our e-mails in your Spam. The only way to fix this is to add the above three addresses to your e-mail address book. Thus far, this has been 100% successful. Although adding , , and , to your address book seems to solve any problems for most users, if you want to be extra certain that our e-mails make it to your inbox, rather than your Spam/Junk folder, add an e-mail filter forcing all e-mails from domains @leagueathletics.com and @crnewtown.org to your inbox. On some systems this task is accomplished by making domains @leagueathletics.com and @crnewtown.org an "approved sender" rather than setting up a filter, but the result is the same. If your child plays Legion baseball, you should also add @post440.org These filters, or approved senders, are usually necessary on more secure corporate e-mail systems, but these filters are good practice for anyone who wants to ensure they receive our e-mails. If any of this is confusing to you or you'd like assistance making sure you have adjusted your email setting correctly, have some test emails sent, etc., please don't hesistate to contact for more help. For additional guidance from LeagueAthletics on ways to fix this problem, click here. Online Registration is a huge time saver for CRNAA Staff. Our Online Registration works on two different kinds users: families who have never played in any CRNAA affliated league before (new users) and returning families. 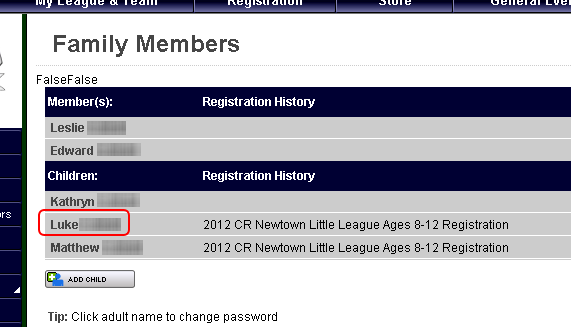 If any of your children have ever played for CRNAA before, you likely have family data in My Account already. If you are a returning family and think you have an account in My Account that you are having trouble accessing (see My Account log-in problems above), please send an e-mail to . The system will allow you to create a new, duplicate account, but that's just something we (CRNAA) have to manually clean up later. If you're a new family to CRNAA, just plug in a good e-mail address to get started and your new account password will be e-mailed to you. The system will help you set up your family structure, which will thereafter be available to you in My Account to update/modify as you please. Online Registration allows you to pay your registration fees via credit card (MasterCard, Visa, Discover Card) or via e-Check. So if you're not a credit card user (or fan), you can still pay your registration fees on-line without ever leaving the website and without ever mailing us an envelope containing your check. Simply indicate that you want pay via e-Check and enter the routing number and account number from one of your checks. The money will be drafted from your checking acount just as if you had mailed us an old fashion paper check. 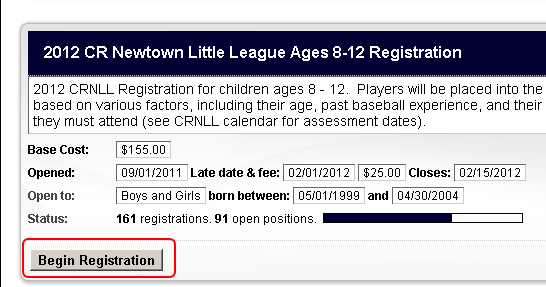 NOTE: Online Registration is public for our Little League and Babe Ruth programs (ages 5 - 12 and 13 - 15, respectively). Registration for Travel, Sr. Babe, and Legion, which are select teams, involves a private registration that will be made available after your child trys out and is selected for one of these teams. Like My Account, My League & Team is an integral concept to our LeagueAthletics sports league management software. Under My League & Team, use the menus to find your child's assigned league and team. 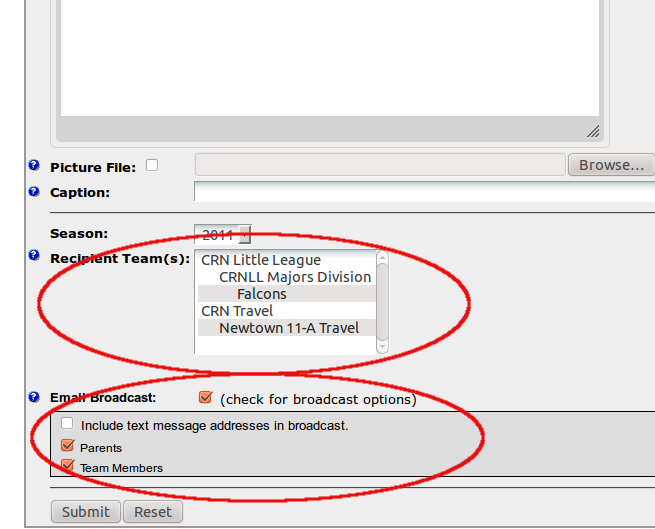 Once you navigate to the correct league, for instance, CRN Little League, you'll find there information relevant to all the team/divisions in our CRN Little League program. Once you locate his/her team, you should see menu options to view the team Roster, Schedule, Standings, etc. 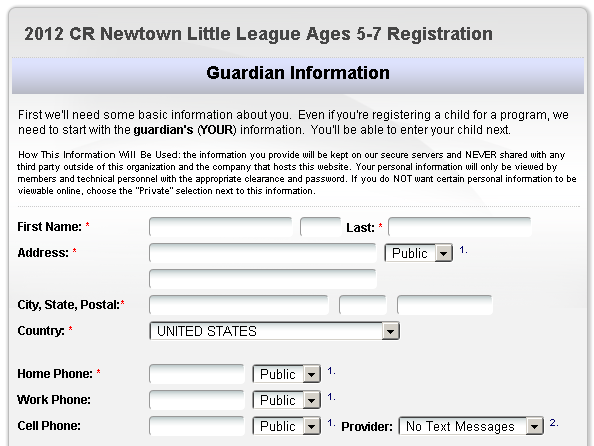 Further, to protect your child and your personal information, you will be required to log in, often at the bottom of the Roster screen, to see full names and contact information. Once logged in, you'll notice that by clicking on links in the team Roster that only personal information that you wanted to be visible will be visible and that different families will provide different levels of information. Further, you will not be able see Roster and/or contact information for other teams, outside of first names. Outsiders will never be able to see any of your personal information unless you set it to Public in My Account. Each team will also have the ability to post photographs in their own team area. 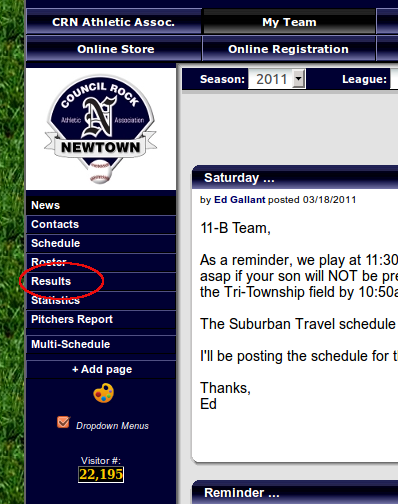 Manager/Coaches of select teams (Travel, Sr. Babe Ruth, Legion) will also see options to record Statistics. These areas will only be visible to the Manager/Coaches. CRNAA is happy to finally have an Online Store capability. We are currently using the Online Store to sell our Sponsorships as well as sweatshirts, tee-shirts, and flannel pajama pants. Look for more items soon. Much like with Online Registration, items can be purchased via credit card and/or e-Check. So there should never be a need to mail in a check payment to make your purchase, even if you're not a credit card user (fan). During registration for any program you will be given an opportunity to upload a copy of your child's birth certificate. If you skipped that step during Online Registration, but would like to upload a birth certificate now, please click here. 8a) How does a parent send an e-mail to the entire team that his/her child is on? 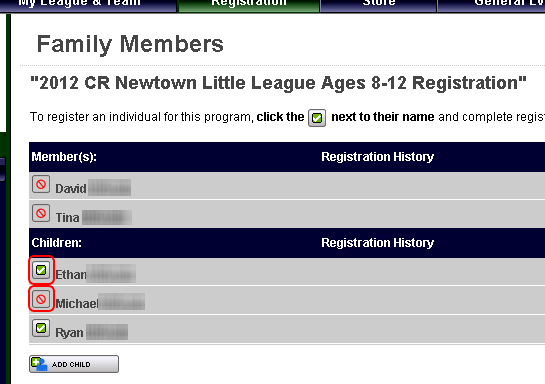 Navigate to your child's team page using My League & Team. Once on the appropriate team page, click on Roster on the left hand column. You'll see a first name, last initial only list (roster) of the players on the team. Scroll all the way to the bottom of the Roster and click on Click here to log on for full roster (see below image). Then log in using your e-mail address and My Account password. You'll then see a complete Roster. 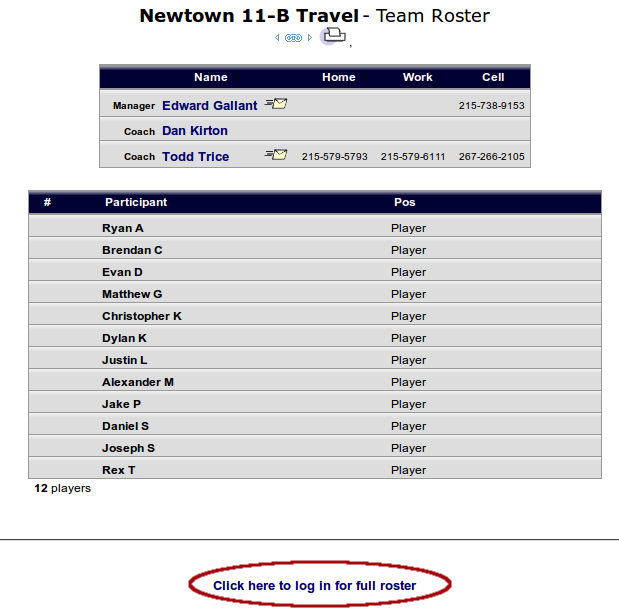 You should also see a link at the bottom of the Roster that you can click on to e-mail your entire team. You'll be brought to a window allowing you to craft an e-mail to the entire team. No e-mail addresses will be shown, they are hidden from you, but the e-mail will go out to the whole team. Don't forget to hit Submit once done typing your e-mail. While parents and/or families should log in via My Account to change/update personal information like cell phone #'s, e-mail addresses, home address, etc., Managers (and Coaches using a Managers id) log in via the CRNAA website using the padlock icon. 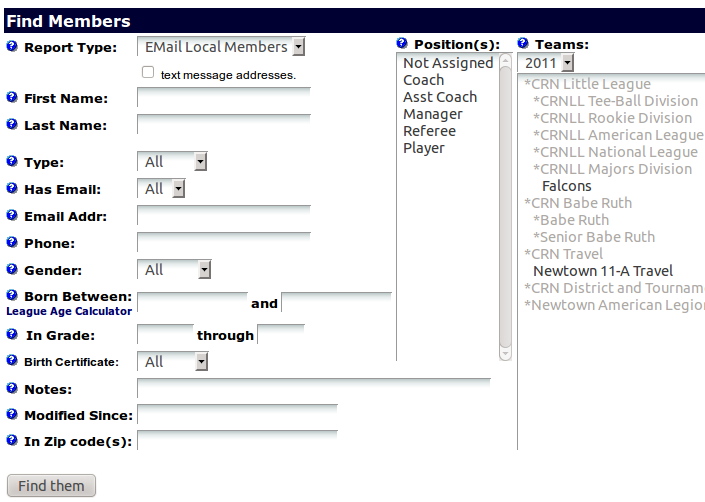 While parents/families should predominently use the league website in which their child plays (CRNLL, CRNBR, Legion), Managers always log into the CRNAA website to do scheduling, scoring, and send team e-mails. While parents/families log into My Account with their e-mail address, Managers (and League Adminitrators) have a login that is their name and then a password that has been provided. After successul login you will be brought to the features area. The main three features you will utlilize will be Team Bulletin, Email Members, and Add Game or Practice. First click on Email Members from the Administrative Features area. When you click Email Members you will first have to select who want to e-mail. Most Managers will only see their in-house team in the teams list as available to them. Some Managers (usually Travel Managers) might see two or three teams available to them. League Administrators will see all teams available to them. You can use the filter screen below to select exactly who you want to e-mail, and there are all kinds of possibilities: just your Coaches, your entire team, just little Johnie's father, all Managers in the league, all youth umpires. Some of these combinations will require administrator privledges, but the bottom line, you can use the available filters to select who you want to e-mail. Rember to hold down the Control key and click to select multiple teams or multiple positions. Once you have selected who you want to e-mail, you click Find Them and the below e-mail authoring tool will be presented, and the e-mail addresses of everyone you selected will be automatically populated. 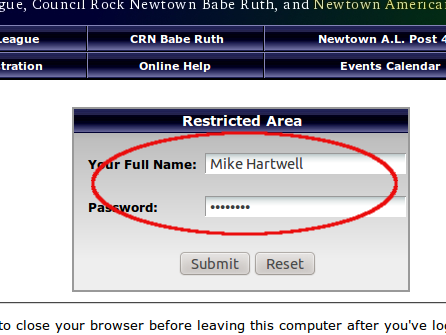 The only thing you need to do is erase whatever is already in the From box, usually Council Rock Newtown Athletic Association and replace it with your actual name (Mike Hartwell below) and in the Reply To: box type a properly formated e-mail address for people to reply to. Then type your Subject and your e-mail and hit submit and you're done! Select Team Bulletin from the Administrative Features area. Team Bulletins are messages that will be posted to your Team Page under My League & Team. 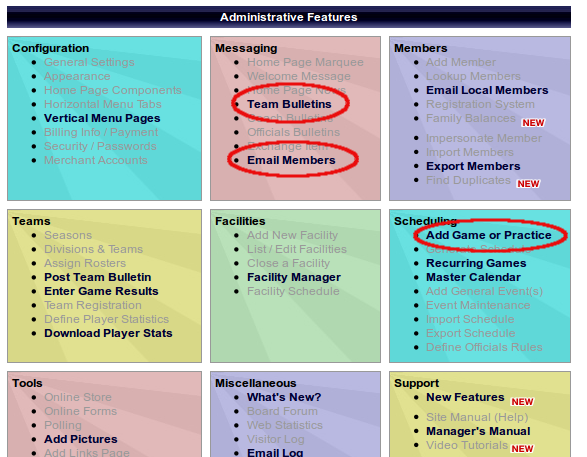 Team Bulletins are posted on your Team Page but they don't, by default, go out to your team as an e-mail. However, you can optionally check a box at the bottom of your Team Bulletin to have your message be posted on your team page as a bulletin AND have it go out as an e-mail. This is the best method of communicating with your team as if gives you the assurance of both e-mail and a public posting on your team page. After finishing this help item, see Online Help Item #12 on how to modify a Team Bulletin to have it also go out as an e-mail message. A window to create your Team Bulletin will pop up. Enter your name in the box next to Author. Enter your e-mail address in the box next to Respond To. Again, Team Bulletins show up on your Team webpage under My Team. The Publish On and Expires After refer to the dates that the message will first show up on the website and the date at which it will disappear from public view. Check archive box if you want the posting preserved so that only you (Admin or Manager) can see it after it expires. This is great for things like tryout announcements and other important postings that you want to be able to PROVE you posted and for how long. Think of the Title section to be just like the Subject line in an e-mail, make sure you put something appropriate in that box. The rest is just like making an e-mail, hit Submit down the bottom when finished. Thereafter, the posting will show up on your Team webpage under My Team. First follow the instructions from Online Help item #11, on how to post a Team Bulletin. After completing your bulletin, scroll to the bottom of the Team Bulletin creation window and select the team which you want the bulletin to be seen by. Then scroll down and check e-mail broadcast. Check the bottom two of three options. Only check the top entry if you also want this to be sent to cell phones as a text message. After you log in as a Manager the first screen you see is the Administrative Features screen (see Help item #9, How to Log In). If you click on Add Game or Practice the below window will pop up. You set the date of your practice, the time and the field you want to use. Note other help items (specifically Help items #16 and #17) on how to determine, before you go to this screen, what practice times are available on what fields. If you pick a time that is already in use by another team, the program will tell you that the field is in use and will not reserve the field for you. 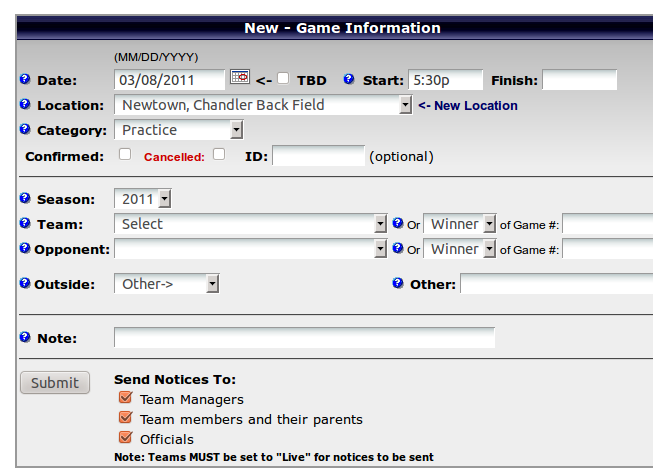 Note that under Category you select whether you are scheduling a Game or Practice. If you want to schedule a Scrimmage and Scrimmage is not listed under Category (it might be already), select Other and type Scrimmage in the Other box that shows up. If you are scheduleing a game, you pick your Opponent from that list. Only In-House teams are in that drop-down list. If you are scheduling a Travel/Legion game against an outside organization, next to Other type the name of your opponent (such as Holland 11-A team, Yardley-Morrisville Jr. Legion, etc.). 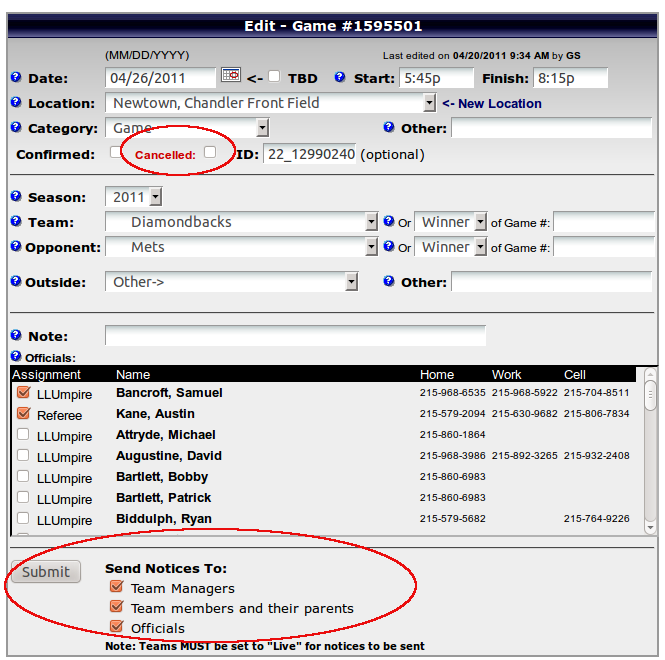 Finally and most importantly decide whether to check the boxes for automatic (e-mail and/or txt message) notification of your Team Managers, Team Members and Parents, and/or Officials. You should almost always leave these boxes checked so that Parents and umps get the automated notifications of new or changed events. After logging in as Manager or Admin, click on My Team. Navigate to your team using the appropriate Year, League, and Team drop down menus. Once you get to your team page, click Schedule. You'll then see a list something similar to the below. 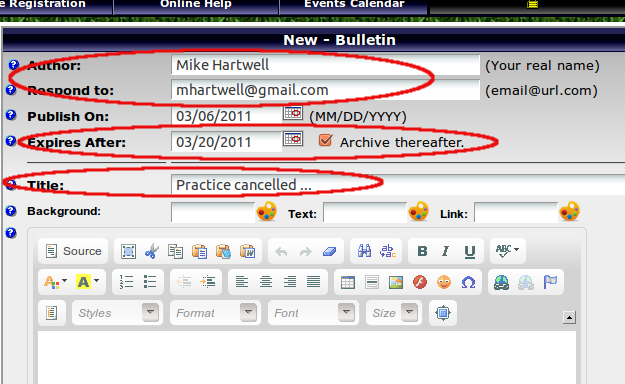 The icons circled on the left are used to edit or cancel a practice. Don't click on the red X's, those are for deleting practices or games. After clicking on the edit event icon (circled above to the left of each event), the Edit Event window will pop up. From this window you can change times, dates, field choice, opponents, etc. Near the bottom of the Edit Event window, where it says Send Notices To: be sure to keep all three items checked. First, and most important, you should almost never delete a practice, you should only cancel it. The only time you should delete a practice is if you've already cancelled it via the website software, and you also want to free up the time slot for another team to use. So, if you cancel a practice because of rain, just cancel it, don't delete it. If you cancel a practice on a nice sunny day, or a few days ahead of time, say because you have 7 kids missing because of the school play, you should delete it AFTER cancelling it so that another team can grab the time slot. It is important to cancel an event because of weather or cancel before deleting an event because the cancel action causes the automated messages to go out to parents and umps. Navigate to your team using the appropriate Year, League, and Team drop down menus. Once you get to your team page, click Schedule. You'll then see a list something similar to the below. The icons circled on the left are used to edit or cancel a practice. The red X on the right is used to delete a practice. Again, deleting a practice will be very rare, cancelling it will be more common. To cancel an event, click on the edit event icon to the left of the event (circled in red above). Make sure all three boxes are checked at the bottom. Hit Submit. Automated notices will be sent to parents and umps. To delete an event (after cancelling it), simply click the red X to the right of the event on the Schedule (see image above). 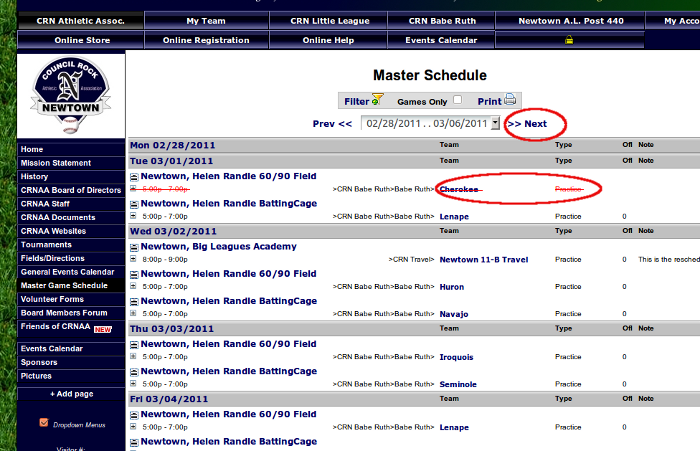 To enter game scores, log into the CRNAA website as a Manager or Admin (see above help items if needed). 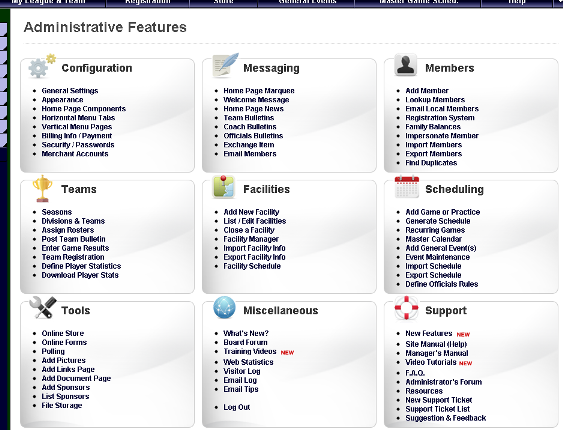 After successful Manager or Admin log in, you'll be brought to the below Administrative Features window. Click on My Team. Navigate to your team, by, for instance, selecting 2011, Majors Division, Falcons. 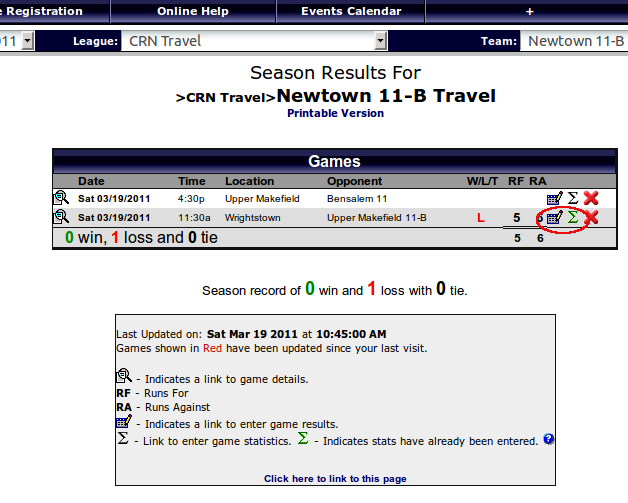 Once you arrive at your team page under My Team, on the left hand side of the window, click on Results (see below). This will bring you to list of recently played games. Click on the enter game results icon (circled in below image). In the window that pops up, uncheck the Email Results box. Then simply enter your total runs and your opponents total runs (see below image). Scroll to the bottom and hit Submit. Click on the game statistics icon (greek sigma symbol). Check the box for each player who was in attendance at the game and then, for only those who pitched, enter the number of pitches they threw. 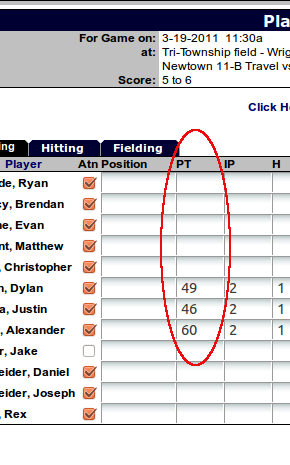 No need to enter innings pitched or any other stat. Hit Submit.